Times Square beach, complete with tourists (as any beach should), found here. 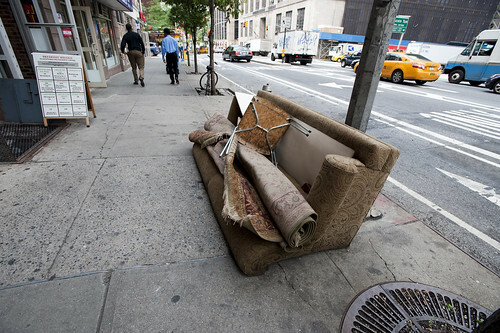 Urban Lounge found near Madison Square, New York City. 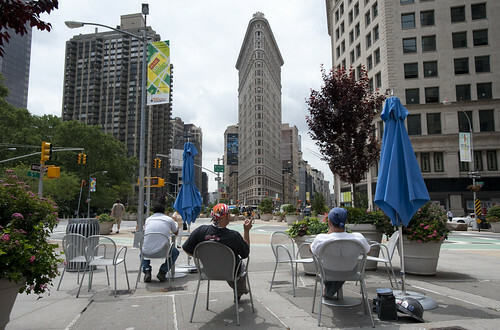 This is probably old hat for current New Yorkers certainly, and something that makes visits home really interesting, these street furnishings and people zones are incredible interventions and nice experiments about alternative urban landscaping. When arriving in Times Square with my brother for a quick screech through of High POV shots, we managed to get one of these curious middle-of-the-avenue parking spots so you basically park right smack in the middle of Times Square. 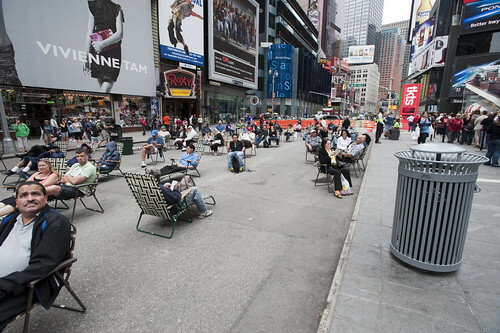 Which is good because you cannot drive through the square itself, only around it, because of these pedestrian urban “beaches”, complete with lawn chairs. According to one of the local business improvement district rangers or whatever they are, tourists quite like it. I wonder if locals find these useful or an annoyance to their conveyance around the city. Not quite the same, but in a different category of street furniture — the dispensed with sort. Why do I blog this? A fascinating example of a reconfiguration of the canonical gridded city. Turning pavement into a more human, habitable space that evokes other leisures is a fantastic way to create new opportunities and to think about new sorts of design practices for urban space. This is an area that many people are curious about of course, and it is something that has attracted the attention of the laboratory quite a bit recently. For some reason, we have been thinking about new kinds of principles, rituals and scouting toolkits for finding new ways to look at the city, using these to think about new kinds of interactive urbanscapes…and not interactive in the “UX” sort of digital-y way. Playful interactions, thoughtful interactions — new rules of occupancy; new social interaction rituals.